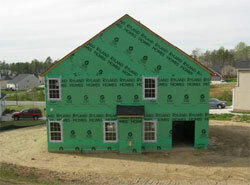 Now that the house's frame is complete, it is time to install the weatherproofing items like windows, doors and shingles. This prevents the exposed lumber inside the house from being exposed to further water or other elements. The shingles are a simple asphalt sheet that is installed by nailing each successive tile over the top half of the previous shingle tile. Some homes have more elaborate or exotic roofing materials like thatch, cedar shingles, steel, copper, terra-cotta or other roof coverings. Asphalt has an the advantage of a very low cost, with a high degree of protection that can last for 15 to 30 years. With our simplistic roof design, the entire surface was shingled in a single morning. The windows are another important feature of your home. Ryland Homes offered highly efficient Low-e windows which are coated with a material between the panes that reflects sunlight in the summer, but retains insulation value in the winter. These windows also have a tilt-in feature for easy cleaning as well as light weight construction for easy opening and closing. The windows are attached with nails to the frame of the house in rapid order. The front window on the second floor has one pane missing so that the drywall crew can easily take out the bottom pane and bring in loads of drywall with a crane to the second floor. You cannot just pick any door for your home, especially if your house is themed. When choosing a door, consider the overall setting, the functions the door will serve, and the spot where it will be placed. Doors come in different materials and sizes, but only a few will fit your home nicely. For instance, classic home designs call for antique-looking doors or traditional panel or swing doors while modern homes fit better with metallic and glass finishes. Doors must be strong and reliable enough to provide maximum security to your household. Solid doors are a good investment in the end. Though they may cost you top dollar on purchase, it will prove very effective in keeping unwanted guests out. Choose doors with a failsafe locking mechanism for added protection as well. On the wall that separates your house from your garage self-closing doors are required in most states in homes that have an attached garage. There are two kinds of doors: interior and exterior. Exterior doors must be more solid and sturdy, unless you want to attract thieves and intruders. Interior doors, as secondary line of protection, may be less solid and heavy than exterior ones. Whether you are living in a suburb full of airy trees and greens all around or stuck in a narrow block in a busy city, strategically placed doors are a great way to keep good ventilation flowing inside your house. All doors can contribute in this aspect, but without the knowledge on how to locate the right spots, it will not work effectively for you. If you want a well-ventilated interior, your architect may be able to help you position the doors. Windows are more easily associated with lighting, but doors also have a say on this aspect. If you envision your home to be light hugging, you have to choose doors that would let light pass through such as glass or French doors. In addition, doors with side lite panels are excellent for light. Transoms can be placed above doors to invite natural light into your home as well. Many doors are customizable with some features that come as a complete set with a door, side lites, and transom included. You can always hang curtains at night for privacy measures. Some doors manage noise and sound better than others. If you live on a busy street, you may want to consider a door with soundproofing properties. If you are into loud, thrashing music and want to give your other family members a break, or have a home theatre downstairs, a soundproof door may do the trick. Doors are not just passive components of your house's frame. Aside from providing protection, adding completeness to the structure, and serving as entry and exit points, doors are one of the most cost-effective means of regulating climate inside the house. Solid and fine quality doors prevent heat from easily escaping your home during cool climates and entering during warm climates. With a door capable of insulation, you can save some money. With an insulated door, you may not have to solely depend on expensive, energy sapping cooling and heating systems. If you are the private type and you don't delight exposing the inside of your room or house from outside, glass doors would not be a viable option. Solid doors made of any material such as wood, metal, steel, or a combination would give you the privacy you want for your home. Finally, consider the cost. Know what you really want in a door and it will be easier for you to find one that you can afford and be happy with at the same time. If you have a budget, you will have to consider what features are the most important for you. Visit your local building supply store to explore the options. Most supply stores have many different types of doors on display. The ability to see the door in person and determine which features are most important for your wants and needs will help you make your final decision.